Confronting climate-driven impacts from insects, wildfires, heat, and drought. Global warming is the driving force behind these impacts, bringing hotter and drier conditions that amplify existing stresses, as well as cause their own effects. If climate change is allowed to continue unchecked, these impacts will significantly increase in the years ahead, dramatically reduce the ranges of iconic tree species, and fundamentally alter the Rocky Mountain forests as we know them. Tree-killing insects have infested and killed more trees, at a faster pace, for longer periods, and over more acreage in western North America than any other known infestation. Large wildfires have increased throughout the Rocky Mountains in recent decades. Wildfire season is now much longer — more than two months longer — than it used to be. Extreme heat and drought have stressed trees, and scientists have observed a doubling in tree mortality in recent years, even in areas undisturbed by insects and wildfires. From 2000 to 2012, bark beetles killed trees on 46 million acres — an area nearly the size of Colorado. The U.S. Forest Service estimates that as many as 100,000 beetle-killed trees now fall to the ground every day in southern Wyoming and northern Colorado alone. Rising regional temperatures have led to reduced spring snowpacks, earlier snowmelt, earlier peak streamflows, and hotter summers. 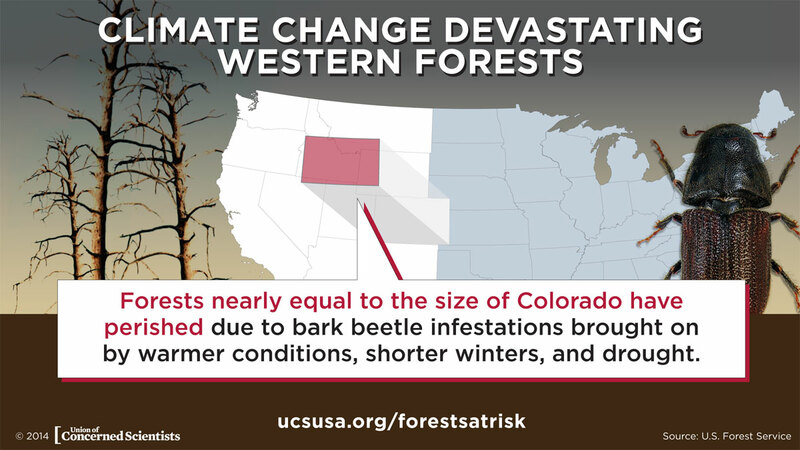 The resulting drier, hotter conditions increase the severity of bark beetle infestations, amplify wildfire risks, and stress trees and forests throughout the Rockies. 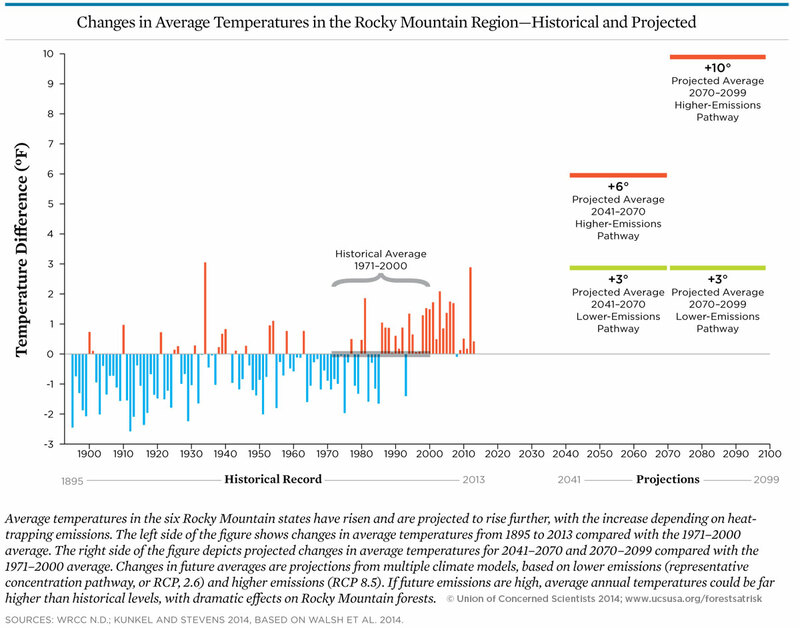 Average annual temperatures have risen more in the Rocky Mountain region than in the U.S. as a whole, increasing 2.1º F since 1895. Whitebark pines are in dramatic decline because of disease, severe insect outbreaks, and changing fire conditions. 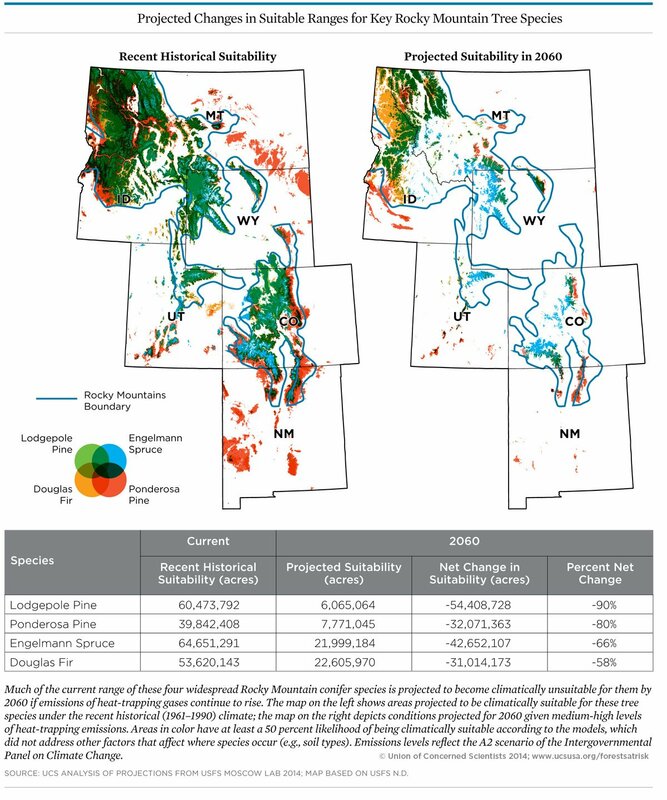 The amount of suitable habitat for whitebark pines is projected to greatly diminish with continued climate change and the species could disappear entirely from some Rocky Mountain states by the end of the century. Much of the current range of four other widespread species — lodgepole pine, ponderosa pine, Engelmann spruce, and Douglas fir — is projected to become climatically unsuitable for them by 2060 if heat-trapping emissions continue to rise. The future of Rocky Mountain forests depends on how much and how quickly we can curb heat-trapping emissions. The dramatic impacts these forests already face — and our scientific understanding of what's driving them — mean that unchecked heat-trapping emissions will bring more abrupt, damaging, and potentially irreversible effects. As individuals, we can help by taking action to reduce our personal emissions. But to fully address the threat of global warming, we must demand action from our elected leaders to support and implement a comprehensive set of climate solutions. The choice is stark: We can act now to preserve the cherished landscape of the Rocky Mountains — or we can sit by and watch this treasured resource degrade irrevocably. The ultimate fate of these majestic forests is up to us. Act Now! Help protect our forests before it's too late. Urge your senators to protect our forests by passing a Climate Resiliency Fund and supporting policies that reduce global warming emissions. Take action now!